Handmade Fabric Heart. Fabric is 100% Pink Cotton with white Butterflies. There is a decoupage of a Butterfly on the front of the Heart. Some Hearts will have 1 Butterfly or 2 small. 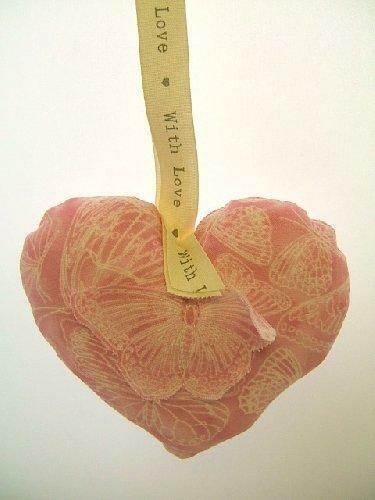 The Heart has ribbon for hanging with wording `With Love` printed on. Filling - Super soft Toy Filling. Will make a lovely mobile to hang in your room or in your car. The Heart is unscented, but you can always spray your favourite perfume on, and the filling will absorb the fragrance.